There, it’s out there now. What a load off. What I mean is in “real life” ® I can watch my friends, family, colleagues, etc and read their varied and personal expressions of emotion, interpret them and react accordingly. Non-verbal communication, folks, it’s where all the cool kids are at. Hell, I teach it in my communication classes. People trust non-verbal cues far more than their verbal counterparts. Why? We can’t shut them off and most of us don’t actively control them. If someone tells you something very sincere then rolls their eyes as they walk off, you’re going to believe the eye roll more than the controllable word choice. It’s human nature. The same applies to our characters in writing. Their non-verbals have to express the underlying truth. As Mark Twain said, “All emotion is involuntary when genuine.” Very often it is the only way to express a character’s emotion and still show instead of tell. This hits a new level when writing in first person, as in my latest works. Both of these are identifying an emotional state without spelling it out. They also help guide the reader to feel the emotional reactions themselves rather than just stay a casual observer. And words should do that. Choosing the right word does more than paint the correct picture for the reader. It also paints the right emotion behind that word for the reader to experience. Hence the different picture a someone paints when they describe the young under average weight heroine as “slender” or “bony” or “petite” or “gaunt” or “emaciated”. Each experience is different for the reader. This I get. BUT this is where my trouble starts. I often go to the same areas of the body for each emotion. One BETA reader a book back actually asked me, “What’s your obsession with backs?” I didn’t know what she meant until I looked back and realized half of all my emotional descriptions were happening with everyone’s back. Boring and inaccurate to human experience. It needed more dimension. Enter my emotional savior: Vicki Leigh. She saw my conundrum and came to my rescue with the suggestion of one book. 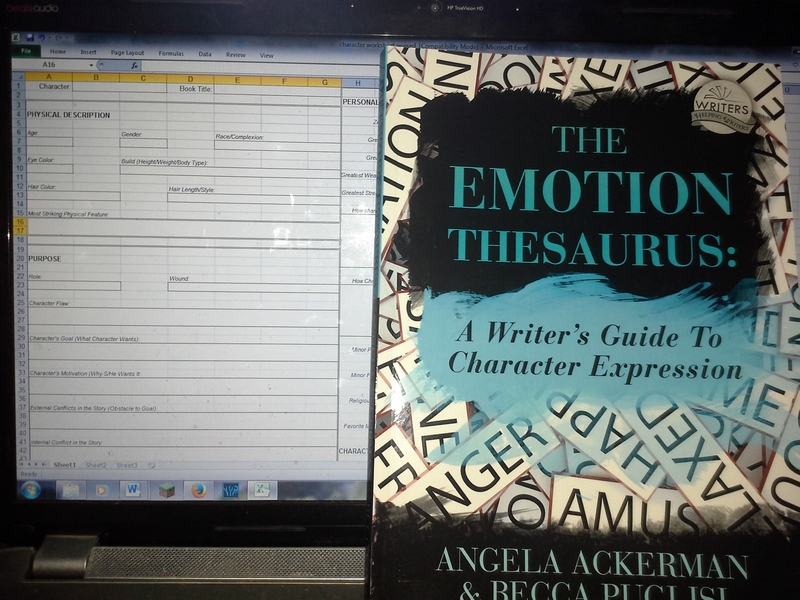 That book is Emotional Thesaurus by Angela Ackerman. This book is amazing. 75 major emotions are each broken down in helpful suggestions in the categories of definition, physical signals, internal sensations, metal responses, cues of acute or long-term, and cues of suppressed. So no matter if characters are experiencing emotions personally or observing it in others, this book has great and varied examples of each. More than giving my books more variety, this is allowing me to personalize each character even deeper than I have before. I am so impressed that I am now also adding a section to my character sheets where I can ID each major characters major tells of different emotions. Thus from the start I can make each characters reaction distinct based on their background, and allow others to learn and respond to emotional cues with a more grown up emotional intelligence. So, thank you, Vicki, you have helped far more already than you know. This entry was posted on Tuesday, January 27th, 2015 at 3:44 pm	and tagged with Characters, Editing, Revising and posted in Writing Process. You can follow any responses to this entry through the RSS 2.0 feed. Great post, Courtney. I’ve had the emotional thesaurus for a few months, I really should use it more. All my emotional tells are stomach related! I know. The stomach tells are a trap, I tell you. I really am adding an emotion section to my character worksheets to try and add these variances more organically. I think an emotion section on a character worksheet is a great idea. Then you have a quick reference point for everyone in the story! I focus on faces: color of skin, position of lips and eyebrows. Thanks for this recommendation!